I Hope you are all well! Are you finished doing what you can in around your home for the year of 2018? 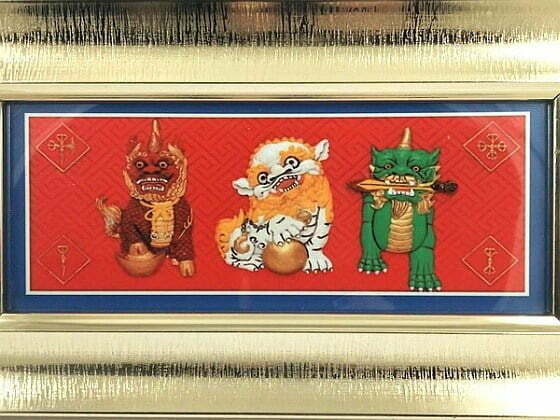 The Good News is that as you know that year has already come to an end for 2018 here in North America and the rest of the world, however you know that the Chinese(FENG SHUI) New Year of the Lunar new Year actually starts on Tuesday, Feb 5th, 2019. The Danielle’s Feng Shui Prosperity Guide for 2019, is your road map for the upcoming year, that has lots of other important information, that will help you increase your good fortune luck and protect yourself and your family (and your business!) from specific misfortune and illness energy. The Chinese and some Feng Shui Practitioners,like me , believe that prevention is definitely better than cure! And here’s the thing…once you know the sectors of your home or office that are afflicted you can take the appropriate remedial measures and apply “cures” that will help prevent you and your family from getting sick, suffering financial loss in your business, getting robbed or sued in court…on and on. Here at CircleofWealth, we take illness & financial loss very seriously, and as hard as it is to get our elderly loved ones to take action, we know what we must do. 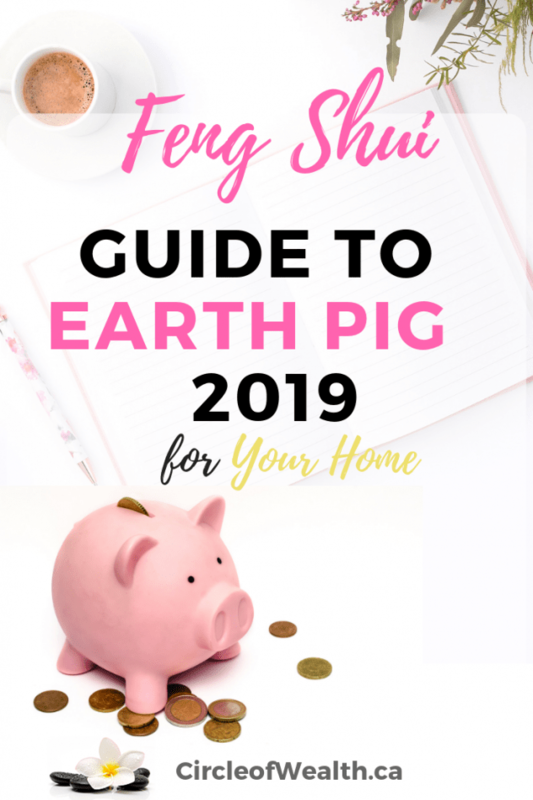 That is why I believe that the Annual Guide for Feng Shui has been designed and implemented, for you to walk around Room to Room and Identify each Area. Easily, 9 simple steps you are done for the year. providing that your home has already been taken care of for its birth element. Because we as a whole like to have a visual representation so that we can send such vibrations to the afflicted areas with many such powerful cures or remedies or, reminders for good health, wealth and prosperity, in your home year after year. 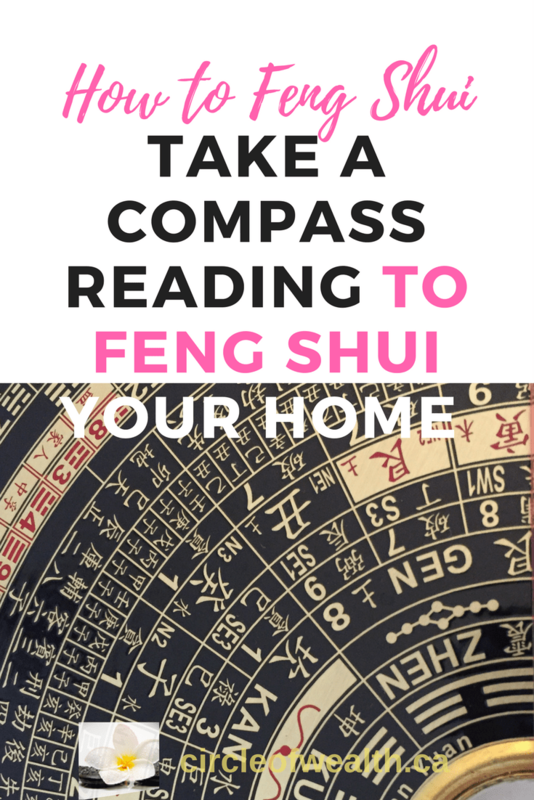 The first step to having good Feng Shui, is knowing how to Take a Compass reading. 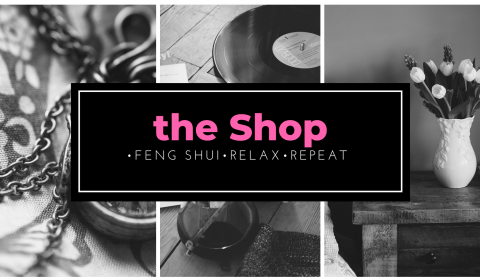 I wrote this little Guide to help you take Compass reading here., if you are unsure how or where to stand or start or why you Need to Know this important fundamental part of Feng Shui. It’s not that little bagua map you may be used to you. I also covered the annual taboos or as I like to call them 3 Annual Afflictions, especially relating to renovations or energy disruption in certain sectors of your home or office this year- like the location of the Grand Duke Jupiter (Tai Sui), the Saam Saat (Three Killings) and the Five Yellow (Wu Wang). Please understand that if you are unaware and unknowingly disturbing these sectors, it becomes very easy for misfortune to hit since these three taboos can override the good feng shui of your home. 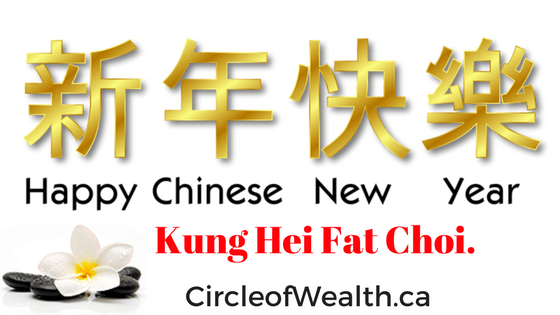 You can learn more about those over at CircleofWealth.ca/blog. You simply cannot ignore how time changes affect your living space (and work space) because they are very powerful and affect the good and bad luck energy in your home and office. You must know, for example, what to do if the 5-yellow afflicts your main door or if the illness star hits your bedroom! And knowing how to enhance the luck in the areas where auspicious stars land not only benefits you but your family as well. 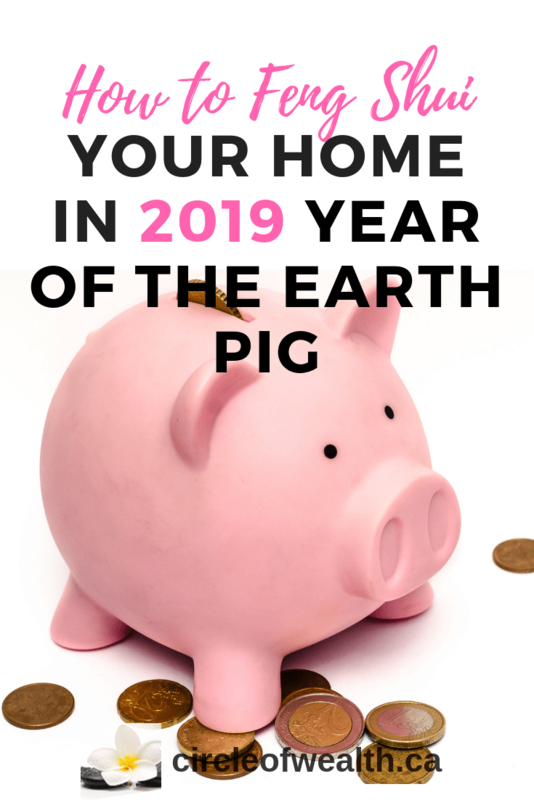 Feng Shui Tip : The center of your home is extremely auspicious in the coming year of the Pig 2019! 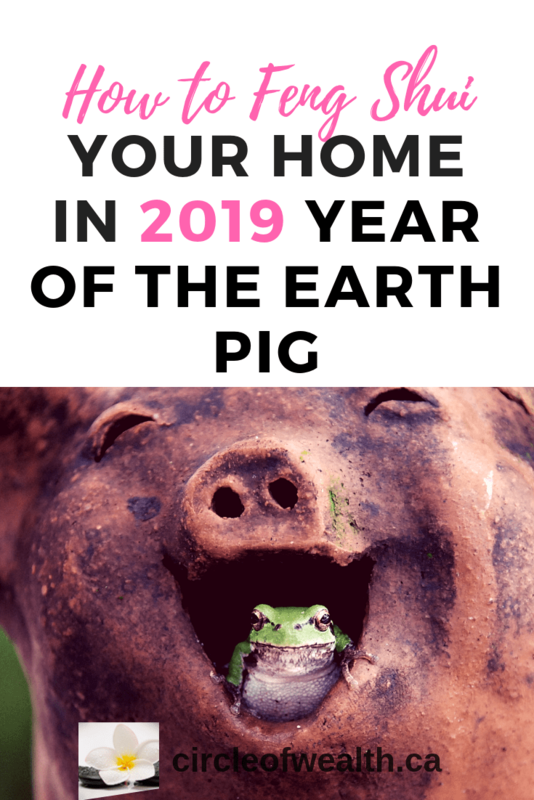 If you missed my last Feng Shui post, I’m happy to let you know that I’ll soon be releasing the Full How to Feng Shui your home for the year 2019 Year of the PIG, very soon like maybe today Please click below and I’ll send you the Workbook I’m creating to go along with it as a little bonus, included just for you. Hurry, this bonus will expire and the price will go back up on Feb 14th, 2019.